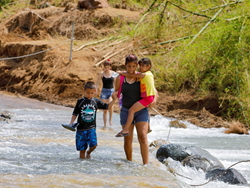 The global humanitarian organization Mercy Corps has taken a multi-pronged approach to support relief, recovery and rebuilding efforts in Puerto Rico following the devastating effects of Hurricanes Irma and Maria. Mercy Corps has delivered 5,000 solar lanterns, half of which were donated by TOTAL, a French energy company with a presence in Puerto Rico. Mercy Corps has also delivered 2,500 water filters and cash assistance to thousands of families facing an uncertain future. “No one really knows when the lights are going to come back on for many Americans in Puerto Rico,” says Peña. "For these families, the rechargeable lanterns and water filters provide a bit of comfort, especially as many communities continue to experience power and water outages." Together with community leaders, Mercy Corps has distributed nearly $300,000 in emergency cash to enable people to buy the items they need most urgently. This influx of cash and buying power also plays a critical role in the ability of local markets and businesses to recover. In the initial aftermath of the hurricanes, Mercy Corps also partnered with World Central Kitchen, a nonprofit founded by celebrity Chef José Andrés, to deliver more than 25,000 meals to hard-hit communities. Despite the hard work of Mercy Corps and many other organizations on the ground, more help is needed. Join us and support Mercy Corps’ work in Puerto Rico and around the world.